When you visit Vegas, you can capture some great moments. After all, you cannot pass up the chance to catch the neon images or the sparkling fountains that make Vegas so special. Maybe you want to visit the MGM Grand Casino when they feed the MGM lions. Capture some more one-of-a-kind scenes by scheduling a Hoover bus tour with Grand Canyon Destinations. Our deluxe fleet of buses will have you riding in style. When you visit the Hoover Dam with us, you can also go on a bus trip that will lead to the South Rim or West Rim of the Grand Canyon. Visit scenic vistas, such as the Skywalk at Eagle point, and watch the rush of the Colorado River. By opting to take one of the Hoover Dam bus tours and Grand Canyon trips, you can make your Las Vegas vacation an even more special event. We can take you to picturesque places – places that will allow you to hone your photography skills and add to your photo collections. See Native American villages, the Hualapai Ranch, and lovely venues, such as Mathers Point. Your first stop-off, the Hoover Dam, represents a large hydroelectric structure in the Black Canyon. 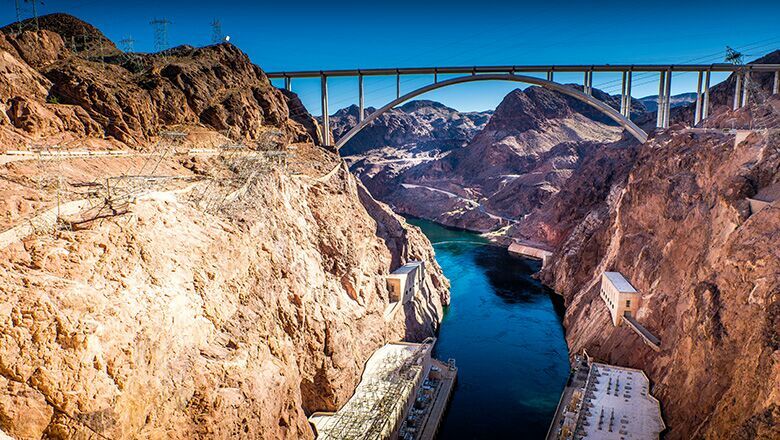 Powered by the Colorado River, the Dam sits between Nevada and Arizona. Named after US President, Herbert Hoover, the dam was built during the Great Depression, or constructed between 1931 and 1936. Whether you are a history buff or just want to see an amazing site, you’ll want to schedule a Hoover Dam bus express tour with us. We offer direct travel to the Dam and Grand Canyon, and provide travelers with panoramic windows, adjustable and reclining seats, video monitors, and onboard restrooms for their convenience. Are you planning a trip to Las Vegas soon? If so, book a trip with us. We will make picture-taking a breeze. Our tour bus enables you to take advantage of a number of photo opportunities. Take pictures of the Dam, the Colorado River, and the Mike O’Callaghan-Pat Tillman Memorial Bridge from one of our luxury vehicles. Book your reservations today!